We sincerely hope that your child is not already addicted to smashing, because with this ferocious costume, it is likely to evolve into his favorite pastime. So it's best to start from a neutral base. Yeah...sorry about that. On the upside, he may get extra good at a few household chores: chopping firewood, tenderizing the dinner steaks, and breaking down cardboard boxes for recycling--and you won’t even need to expose him to any gamma radiation. And just look at how happy he is! Priceless, right? Plus, this costume may really teach him the benefits--like Bruce Banner has been trying to learn--of controlling his anger and saving it for special occasions (as in: pound that steak kid. Smash it to smithereens!) 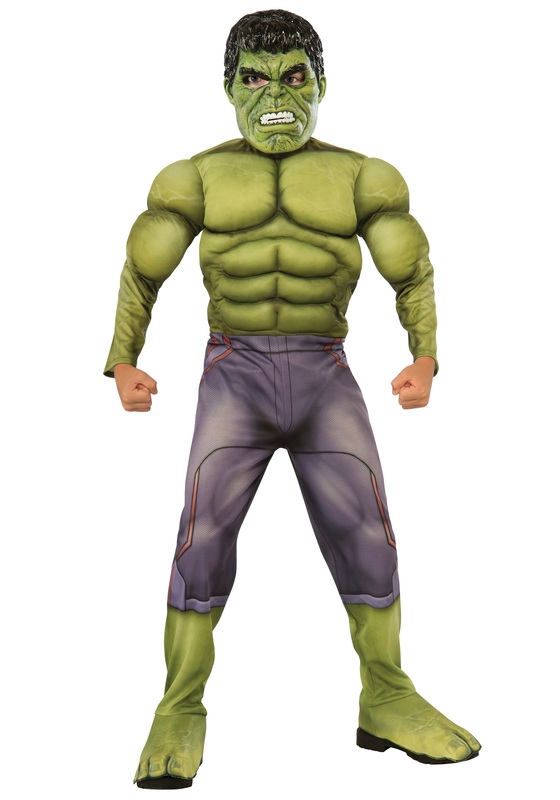 If nothing else, once he is dressed in this Child Deluxe Hulk Avengers 2 Costume, he will be fully suited up and ready to smash, smash, smash in case this Ultron character shows up! In this sculpted and printed jumpsuit, he will be instantly transformed into the big green guy in Age of Ultron. We know he looks scary in the molded mask, but it’s much better to have the Hulk on your side than against you. And when the neighborhood Avengers need his help, all you'll have to do is get him a little bit riled up...which shouldn’t be too hard; after all, isn’t there a whole big stack of wood out back that needs chopping?